There’s an interesting new wrinkle to the conventional non-flat standing desk mats that go beyond the usual expansion of colors, sizes, and designs. So-called calculated terrain mats (a.k.a. 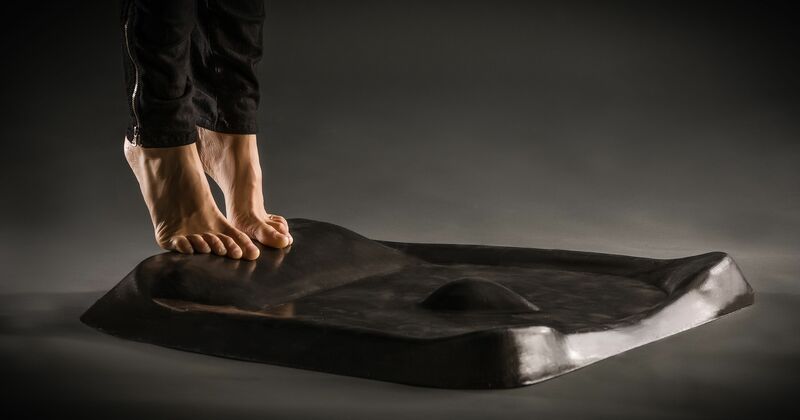 “non-flat standing mats” or “active standing mats”) are a new subcategory of standing mats that appears to be exploding onto the scene—with new competitors rushing in to nip at the heels of Topo Mat, the progenitor of this entire niche. We put these newfangled comfort mats to the test to see if they’re as game-changing as their makers say, or just a passing fad. Each standing mat we tested bears very specific topographical features to promote interaction with its user. From angled slopes for stretching to massage mounds for plantar fasciitis relief, these calculated terrain mats offer something different for everyone. While many of these mats can be visually attractive to potential users, the unique features they offer may not always perform as well as intended. In fact, some features can be so poorly designed or even gimmicky, that they may as well not be there. However, through our research, we have found that there are some quality options for you to choose from. Calculated Terrain Mats. Originators. Also known as topographic mats. Imitating earth’s topographic features like ridges and rocks, these mats are best for promoting proprioception and active standing. Non-flat mats. Providing too little topography to be considered ‘calculated terrain’ and offering no special features to promote activity, these mats are a more interesting-looking alternative to flat mats. Active mats. Active standing mats don’t necessarily have to feature calculated terrain. Some models come with balls while others have integrated fidget bars. Go back in time a few thousand years and you’ll find our human ancestors were designed to stand and walk across a widely varied terrain — from loamy soil to rocky hills. Fast forward to the modern-day era and you’ll find the exact opposite as humans in first world countries have become accustomed to walking across completely flat floors and sidewalks, in flat-soled shoes, for most of their adult existence. In accordance with the law of unintended consequences, this has led to a variety of new health-related issues—including an assortment of foot maladies, and even premature loss of balance. The latter due to reduced stimulation of the proprioceptor nerves in our feet due to walking primarily on flat terrain, and leading to an inordinate propensity for premature hip fractures among our senior citizen population, among other things (as expounded upon in the bestseller Born to Run: A Hidden Tribe, Superathletes, and the Greatest Race the World Has Never Seen). Even with the introduction of standing mats as stalwart companions to standing desks in the fight against sedentary office habits, many have found standing for too long to sometimes be just as bad as sitting for too long. Studies have shown that rigid standing for too long is causing people to experience circulation problems in the legs, joint pain, and most importantly compression of the spine leading to low back pain. Combined with the idea that our human ancestors were designed to walk across variable terrain, you can see how calculated terrain anti-fatigue mats make sense as a way to promote movement while standing, all in the effort to prevent those unwanted health consequences. As stated earlier, some mat features can be gimmicky and offer little to no use for the user, so it’s always good to keep in mind what it is that you want in a standing mat. Another aspect to think about is where the mat is manufactured. There’s a huge difference in the environmental regulation compliance requirements of US-made versus Chinese made products when it comes to the materials typically found in comfort mats. Organizations like ANSI (American National Standards Institute) and NFSI (National Floor Safety Institute) lab certify mats for quality, and we recommend only purchasing mats that have passed neutral third-party testing. While it costs more to buy a high quality, environmentally friendly mat, if you want durability, longevity, and clean air, these products are the wiser way to go for savvy consumers. Less expensive mats also tend to exude odors that can make users nauseous, especially in closed spaces. We have noticed that some Chinese-made mats can reek of de-molding fluid, which also leaves them slick and prone to slippage, versus quality US-made mats that are thoroughly washed before shipping to the consumer. The biggest difference between makers, however, comes down to material formulation. There’s a vast difference in both the chemical formulation and the density of material used in imported versus domestic products, which affects their performance. All that said, there are no calculated terrain mats made in the USA at this time. All the contenders, at least for now, hail from China. And their relative quality falls along a spectrum from reasonable quality (not as good as American-made flat mats, but good enough) to something that would smell up your home or office. The best policy is to thoroughly read our expert staff’s reviews, coupled with user reviews from verifiable buyers (which we link to from each of our expert reviews), and not simply accept manufacturers’ marketing claims at face value. They often sound too good to be true, because they are. Looking For Flat Standing Mats? If you aren’t interested in Calculated Terrain Mats but you are interested in more of a standard but quality standing mat, check out our Standing Mat Guide or Standing Mat Comparison Review page for expert analysis on the most popular standing desk mats in the marketplace. Below, you’ll find abstracts of each of our standing mat reviews. Click on the product name to go to the full review, or the button “Add to Comparison Table” (then ‘Go’ in the bottom right) to see their features side by side. Summary: Though it can improve in areas in terms of stiffness and rigidity, the CubeFit TerraMat is a durable standing mat designed to provide you with a variety of features, keeping you energized and moving at your workstation. By using your feet to shift positions, you can reduce body strains, improve balance, and keep your body engaged throughout the day. You will find yourself more energized at your work station – just remember to tuck the mat away when you’re done to prevent tripping hazards. Summary: Flexispot Ergonomic Office Anti-Fatigue Mat is one of the thickest non-flat mats we’ve tested. Providing all the benefits a solid polyurethane mat can offer, this one also features massage nodes that may provide relief for sensitive feet and further improve blood circulation. Simple design allows for plenty real estate while grippy underside gives the mat solid traction. Summary: While quality mats provide a standing surface that’s both robust and comfortable, the Topo mat from Ergodriven takes things to the next level with its irregular surface. 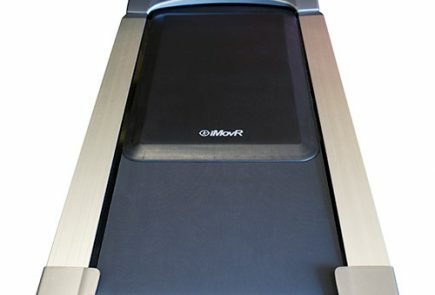 Unique calculated terrain features keep users engaged in a wide variety of foot positions, encouraging continual movement throughout the day. These features are novel, but for the price, you’d expect more basic comfort from your standing mat, and the ridges leave a lot of users feeling too constrained. Summary: Testing this product in our labs only confirmed our initial impression of it being a poor imitator of the category progenitors – Topo and TerraMat. Aside from providing a cushy surface thick enough to support you through hours of standing, Ergohead Standing Desk Mat fails as a calculated terrain mat, designed to promote blood circulation and relieve foot strain with its impotent massage mounds. In addition, its offensive smell pollutes the air, and slippery back surface creates a safety hazard in the office. Summary: This review is in process. Please subscribe to our free newsletter to stay abreast of all our office fitness product reviews as soon as they are published. Non-flat standing mats are for those who find themselves halfway between wanting a flat standing mat and a feature-heavy mat (active or calculated terrain). If flat mats don’t appeal to your senses (be it a sense of touch or aesthetic taste) and active mats or topographic mats seem too restricting—or perhaps, too big for you to be able to take advantage of their features—a non-flat standing mat is an excellent alternative. Non-flat mats are numerous. They all originate from the calculated terrain subcategory, and as much as they provide little use for proprioception, massage, or activity, they are usually more intriguing design-wise than all the others. Only this category brings as much variety as you might find in a popular toy store. Summary: If you’re bored by the very idea of plain rectangular standing mats and want something with a little more flair, perhaps to serve as an expression of your own creativity, this is one you should seriously consider. The PVC outer layer compromises the quality of the mat and may not offer the same buoyancy or durability of a 100% polyurethane alternative. 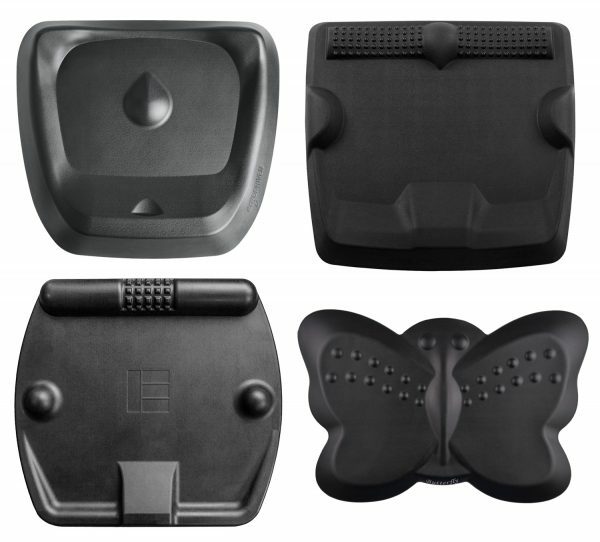 Nevertheless, the eye-catching design and ergonomic credentials make the Butterfly mat a great choice for the right buyer. Summary: Another calculated terrain mat imitator that comes in a commendable size but fails to function as advertised. Low-density polyurethane foam, while lasting, provides very little support required to accommodate ‘over ten standing positions’ or perform calf stretching, foot massage, or rolling. In addition to overly soft features the mat glides easily on carpet floors, creating a slipping hazard for users. Not a good value for the price. Active mats can vary significantly in both concept and execution. Some may come with topographic layouts among other things while others look like traditional flat mats with ultra special features that include massage balls and foot bars. The upside of active accessories like massage balls is that they ensure movement rather than forcing you to rely on subconscious body adjustments. But they share a downside with the calculated terrain mats in lack of safety. You can easily trip and fall if you’re not mindful about removing the balls when they’re not in use. Warranty: 2-year warranty against manufacturer’s defect, including parts and pieces that come with the board. Summary: Wurf is an inflatable mat that you can use as a wall decoration if you so wish, but really it promotes activity throughout the day unlike a flat polyurethane mat. Although it’s not as ergonomic, the Wurf board offers some relief from heel pain and enough cushioning to keep your feet happier. 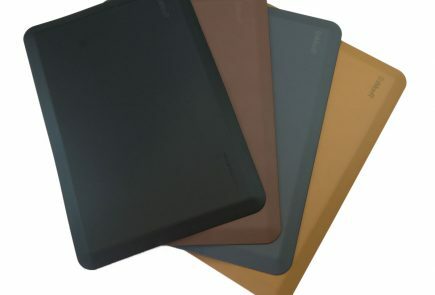 Summary: Licloud Mats’ Standing Desk Mat belongs in two sub categories of non-flat mats. The calculated terrain, though ineffective, puts it in line with the topographic mats above (at least nominally) while the massage balls render it active. The mat’s quality leaves much to be desired, as it sinks and bottoms out under the lightweight. The massage balls encourage constant movement but they, too, squeeze under pressure, which is not at all useful to heavier users. On the plus side, you get two mats in one for the same price. If you’re looking for something even more engaging that will keep you moving throughout the day, read our comprehensive review of Standing Desk Balance Boards. And if you prefer classic mats, go check out our round-up of Flat Standing Mats. Subscribe to our free newsletter to not miss our new non-flat anti-fatigue mat reviews. What is the ETA on the reviews for rest of the calculated terrain mats? Hi Jess, a new calculated terrain mat (Licloud Standing Desk Mat) is due into our labs in a couple weeks. We’ll test it out and publish the review shortly thereafter. As new mats arrive over the summer/fall, we’ll review them and update this page. 4 stars: I received my Topo Mini last week and so far, I love it. It is made for shorter folks like myself (5’5″). I do not feel at all constrained by the sides, but it is too small for my 6’2″ hubby and 5’8″ daughter . The massage features are really appreciated. as are what I call the “open arch docks” in the back.